I’m working through Julia Cameron’s “The Artist’s Way”, and one of the weekly exercises is to take yourself on an Artist Date. The only parameters are that you must do it alone, spend about two hours, and do it every week. I’ve gotten a little anxious trying to think of things to do that I would enjoy, so I decided to sit down and brainstorm a list. 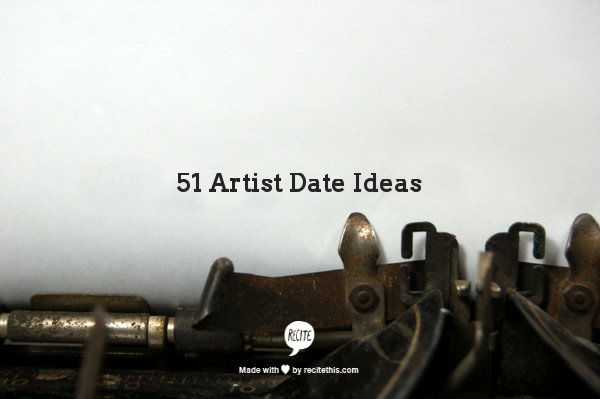 I’d love to hear in the comments below what kind of artist dates you’d like to go on, or have taken yourself on. I can always use more ideas! Treat yourself to one of those “Paint and Drink Wine” workshops, like those atPaintNite.com. Two hours, a couple glasses of wine, and a finished painting to take home with you! Browse through a thrift store or antique shop and buy one thing that really inspires or excites you. Browse through an art supply store and treat yourself to a new brush, some paint, some fun paper, a new pen, or whatever else you fancy. Walk through a street fair. Stop and check out the items for sale, sample a new type of food, and people watch. Take a tour of a local botanical garden. Photograph or sketch the plants and flowers. Take a stroll along the beach at sunset, and pick up interesting rocks or shells. Check out a local museum and spend time in one exhibit, reading about everything on display and completely immersing yourself in the experience. Go to the movies and see a film you might not otherwise see. Go bowling or play a round of mini-golf. Go to the fair and win yourself a stuffed animal. Take a ride on the Ferris wheel and see the world from a different perspective. Spend an afternoon at Chuck E. Cheese, eating pizza and playing skee ball or video games. Lie in a hammock and simply admire the trees and sky above you. Look for birds and listen to their calls. Go to the library and choose a few CDs of music you’ve never listened to. Treat yourself to ice cream at an old-fashioned ice cream parlor. Try a new flavor. Sit in the park and people watch. Go for a walk in nature, and listen to the sounds around you. Go for a long drive to a place you’ve never been. Rent a bicycle and take a ride along a bike path. Go to a high-end department store and try on fancy evening wear. Imagine the parties or events you could wear them to. Check out a metaphysical store, and choose a healing crystal that addresses some of the areas of your life you want to work on. Get a palm reading or have your tarot cards read. Go to a used bookstore and linger, browsing through the various titles. Choose one to buy and take home with you. Go to the farmer’s market. Pick out a fruit or vegetable you’ve never tried and take it home and make something with it. Go to an international market and browse all the different types of food for sale. Choose something you’ve never tasted and try it, or take pictures of all the neat things you find. Attend a public lecture at a college or university. Take an art workshop from you local community college or library. Attend a free movie night in the park. Find a recipe you’ve never tried and make it for dinner. See a play. It can be a Broadway play or one put on by your local high school. Attend a live music event. Search the Internet for local music concerts that are free to the public. Take a tour of a historic home. Explore your town’s Chinatown or another ethnic neighborhood. Browse your local nursery for herbs and make your own kitchen herb garden in a pretty pot. Browse seed catalogs and plan a vegetable garden for next summer. Attend a religious service or join a meditation group. Take a ride in a pedi-cab. Go to a lake and rent a paddle boat for an hour. Create a board on Pinterest with ideas for your dream studio space. Go shopping at yard sales and look for unusual items. Go to a comedy club and watch some stand-up or improv. Go to the park and fly a kite. Sit in a coffee shop, enjoy your favorite drink and read the Sunday paper or people watch. Write hand written letters on pretty paper to loved ones, or send postcards even though you aren’t on vacation. Sit in the lobby of a big hotel and people watch or daydream. Go to the zoo and find your favorite animals. Volunteer to read for the blind or help out at a soup kitchen or other charity. Go to a fancy department or lingerie store and buy a really great pair of underwear. Visit a meditation garden and simply sit quietly with your thoughts. Explore a neighborhood you really like, find the houses for sale, and imagine what it would be like to live in them. Pop into an open house if possible!